At the end of the Meiji era, people started to have time for leisure so the Hakone 7 hot-springs, including Yumoto, Tounosawa, Miyanoshita, Dougashima, Sokokura, Kiga and Ashinoyu, were always crowded. 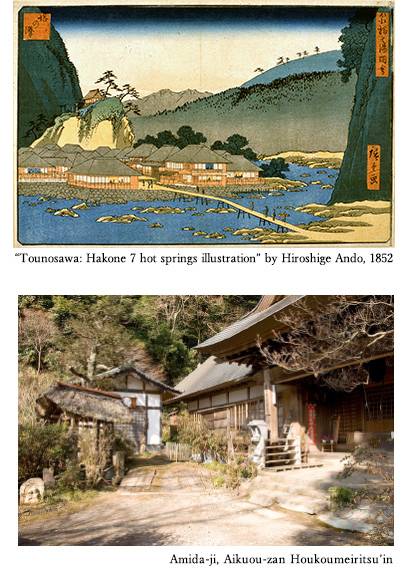 In particular, Tounosawa hot-spring, to which Kansuiro Ryokan belongs, was already very popular by then. Lord Mitsukuni of the Mito domain and the Chinese famous Confucian Zhu Zhiyu visited here during the Edo era. They were impressed deeply with the beautiful scenery and the quality of its hot spring, so Zhu gave Tounosawa the another name “Shourizan” to express how excelling the scenary is. Kansuiro Ryokan was formerly called “Motoyu Suzuki”. There was one man named Hirobumi Ito who visited Motoyu Suzuki frequently. He was one of the leaders of the shogunate at the end of the Edo era and later became the first prime minister of Japan. Mr. Ito visited and held parties here many times. One day he made a Chinese poem to be given to the first owner, Zenzaemon Suzuki, as a largess. 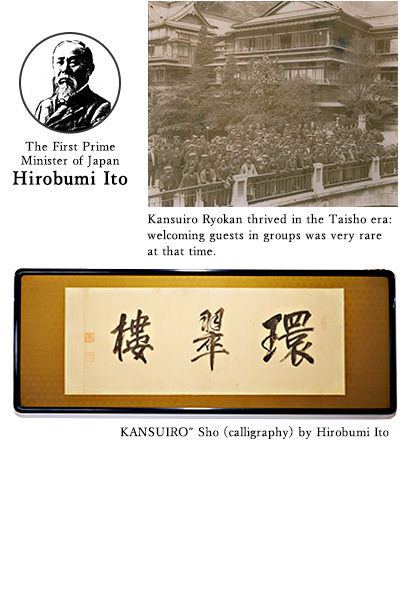 Mr. Ito picked up 3 characters from this poetry — 環 (kan), 翠 (sui) and 楼 (ro) — then, the Japan’s first prime minister re-named this hotel as “Kansuiro”. Later, in 1895, an attempted murder known as “the Otsu incident” happened. The Russian Emperor Nicolai was attacked by sword in Otsu town of Shiga-ken during his visit to Japan. Prime minister Ito was informed of the incident here at Kansuiro Ryokan. Indeed, the history of Japan has been watched by Kansuiro Ryokan. The relationship between the shogun family and Hakone area was established through the custom of “okumiyu” — giving hot spring water. There is a record of carrying hot spring water in barrels to the Edo Castle and records say this custom has continued from 1644 until 1706 during the Edo era. 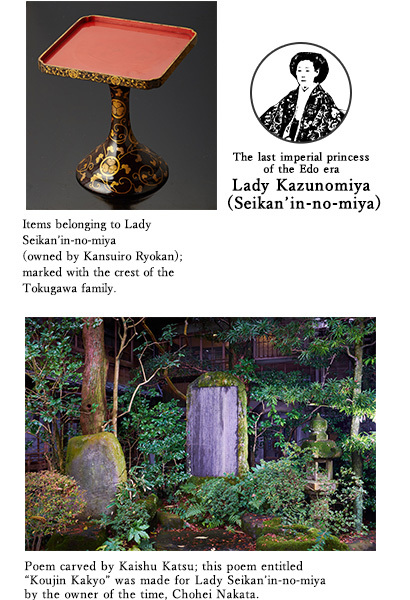 In 1877 Lady Seikan’in-no-miya (formerly named Kazunomiya) arrived at Kansuiro Ryokan for recuperation and stayed for a considerable time. She invited children nearby to join her in order to have close contact with ordinary people. Hayakawa river flowed a lot faster at that time so the sound of the stream was louder. Chohei Nakata, the owner of Kansuiro Ryokan and also the chief of Tounosawa village, tried to moderate the stream by putting some fences in. According to local records, Lady Seikan’in-no-miya was so pleased she held a poetry-reading party to express her appreciation. After a while, Lady Seikan’in-no-miya passed away here in Kansuiro Ryokan. Mr. Nakata kept working on the stream moderation to express his respect to Lady Seikan’in-no-miya, and later opened Tounosawa tunnel to control the flow of the stream. Thanks to these people, Hayakawa river still flows calmly. Tounosawa hot spring, to which Kansuiro Ryokan belongs, was discovered in 1604 at the very beginning of the Edo era by the Buddhist monk Tanzei Shonin. He came down to take a rest by Hayakawa river, and coincidently discovered a hot spring. From that time, it has prospered for more than 400 years. The origin of the name ‘Tounosawa’ comes from Amida-ji temple nearby, which was inaugurated by the monk Tanzei Shonin, being built at the place where a stupa was found. Consequently the area was named ‘Tounosawa’, which means ‘stream of the tower’. This Amida-ji temple houses the grave of Lady Seikan’in-no-miya who passed away at Kansuiro Ryokan in Tounosawa. The temple is famous for its hydrangea, too. Stayed in this hotel (formerly called Motoyu-Suzuki) according to records made by Onoko-zan, a Chinese poet at the end of the Edo era. He invited the Confucian scholar Zhu Zhiyu from China, and Zhu left the poem that became the origin of the name Kansuiro. 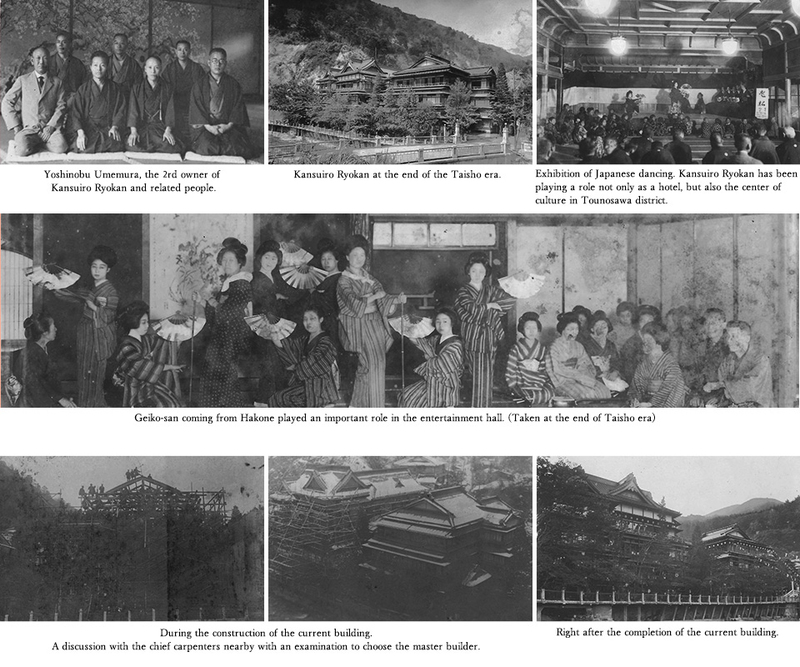 Right after the accomplishment of the Xinhai Revolution in 1911, Sun stayed at Kansuiro Ryokan during his exile. Liang Qichao also stayed here, escaping from the Qing dynasty. Li stayed at Kansuiro Ryokan during his visit as a representative of the Qing dynasty after the Japan-Qing War to conclude a peace treaty. Li left a handwritten note which has been preserved by Kansuiro Ryokan. Visited and stayed at Kansuiro Ryokan at her own wish in 1880, to visit the place where Lady Seikan’in-no-miya spent her last days. Lady Tensho’in lamented out loud thinking about Lady Seikan’in-no-miya while gazing at the stream of Hayakawa river. After the settlement of the Japan-Russo War around 1905, Admiral Togo and other members of his cadre gathered here at Kansuiro Ryokan. A very popular sumo wrestler at the middle of the Meiji era (end of the 19th century). He stayed at Kansuiro Ryokan in 1904 and began visiting regularly after finding a kindred spirit in the owner Mr. Zenzaemon Suzuki. He gifted his own handprint as a memory of their friendship. Stayed at Kansuiro Ryokan for hot spring recuperation after an illness in 1912. Since then he kept visiting and made a monument to mourn the victims of the Kanto Great Earthquake together with the owner Yoshinobu Umemura. Stayed here in 1890, as well as Toson Shimazaki and Sanshu Cho. In 1923, he held a joint review meeting of the literary magazine “Shincho” here at Kansuiro Ryokan with other literary people such as Shusei Tokuda, Masao Kume and Mantaro Kubota.